Can you ever have too many closets? We are fortunate to have a house with plentiful closet-space (though don’t think for a second that I have abandoned my dream of turning a bedroom into a giant, fancy closet someday - complete with an island of drawers and angled shoe shelves). One of the closets in our bedroom is a cedar closet. It’s exactly what it sounds like – a regular closet with cedar plank-covered walls. Sometimes I look at it and think man, if only we had a cubic ton of salmon to grill. We could really go to town. Instead, it’s the repository for a giant down comforter (from our Michigan days) and all our wool suits. The realities of living in a hill home mean that we don’t have a basement, so no wine room (next house, next house, next house, she says plaintively, ignoring the fact that this will be ridiculous without substantially more wine). Instead, we stack our nice wine on the floor of our cedar closet, where it stays uselessly moth-free. Amassing a small collection of Very Good Wine is worth the money and effort, if you’re into that kind of thing. It’s always nice to have a snazzy gift on hand for oenophilic friends, and special dinners at home become that much more lovely with the occasional treasure we’ve been saving until it’s ready to drink. That’s all well and good, but more often than not, I want something other than a $40+ bottle of wine. There are several funny little slots for wine built into the Salty Spoon kitchen cabinetry. I like to keep them stocked with inexpensive wines (preferably less than $10 a bottle) that I would feel no qualms about opening on, say, a Tuesday. Until recently, I kept the slots full with grocery store finds. 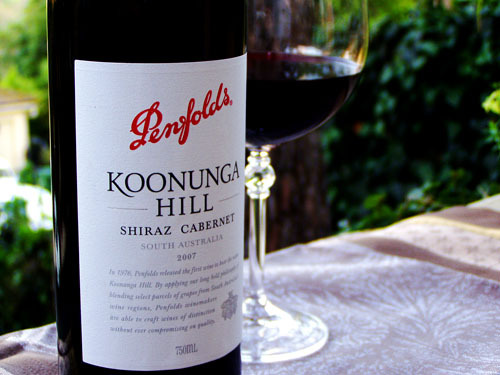 But one day, we stumbled upon this Penfolds Koonunga Hill Shiraz Cabernet at Costco, and the world changed. It’s a truly lovely table wine. Inexpensive and readily available at the Burbank Costco, John buys a case whenever we’re running low. The 2006 was really something special, and the 2007 is no slouch, either. Though I am a total sucker for a beefy, tobacco-y, berry-laden zinfandel, I often want something that will play more of a Cloris Leachman supporting role with my meal rather than a Meryl Streep lead. Enter Penfolds. This is a wine you can easily drink by itself while you cook or brood about your day in the tub, but it’s substantial enough to stand up to a full dinner. At less than $8 a bottle, I never feel bad about adding a slug to whatever I’m cooking. And, I’m sorry to say, I can safely report that it’s pretty good with chocolate chip cookies. But let’s pretend none of us know that. One note - the 2007 reeeally wants to open up a bit after pouring. No need to decant the whole bottle, but it’s worth letting it catnap for a few minutes after you pour a glass before you dive in. Oh I know what you mean, blooot. I have tried to describe wines in the favored (and bizarrely) noun-packed, wine-y terms and I can’t keep a straight face for more than a sentence or two. The Salty Spoon is powered by	WordPress 2.7 and delivered to you in 0.191 seconds using 24 queries.